October Gallery continues to promote the trans-cultural avant-garde (Transvangarde), by representing artists from around the planet . This winter’s exhibition is no except ion, featuring alone in the Front Gallery: “In the World But Don’t Know the World?”, a major new metal sculpture by EL ANATSUI, straight from its recent premiere at the 3rd Moscow Biennale, (2009). 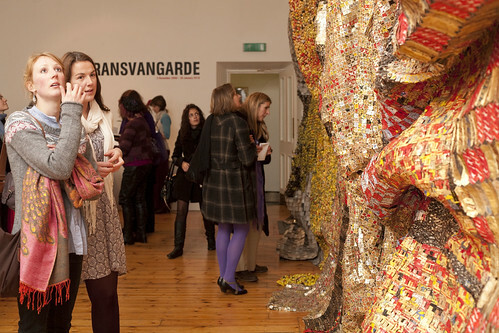 El Anatsui has to date explored a wide range of different media and materials to create a wealth of different sculptural pieces over a long and distinguished career. Of late, he has drawn much attention worldwide with his highly ingenious metal sculptures made from tens of thousands of liquor bott le-tops forming magnificent wall sculptures. The title “In The World But Don’t Know the World?” references the new developments in understanding by which humanity strives to progress. The work consists of a series of independent and interchangeable units and with its free-flowing possibilities of form becomes a metaphor of the mind’s creation of meaning – as much an epistemological tool as it is an object of beauty. This is the first time this metal sculpture will be exhibited in the UK. ‘Transvangarde’ will also include selected works from other prominent artists; an ethereal photograph by Chinese artist Huang Xu, poetic calligraphy from Sufi artist , Rachid Koraïchi, canvases of serene beauty from Kenji Yoshida, an explosive, vibrant painting by Aubrey Williams, and influential work by radical cultural visionaries, William .S. Burroughs, Brion Gysin and Gerald Wilde. With works from Algeria, Japan, China, North America and Africa, this winter’s Transvangarde exhibition is a truly international look at art .